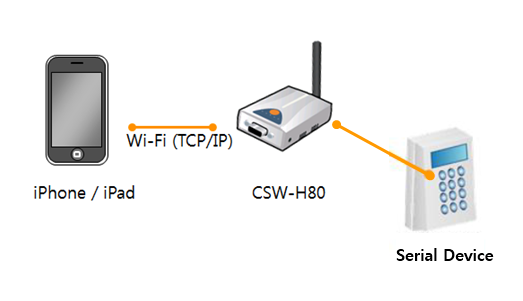 ezTCP’s WLAN products such as CSW-H80 can be connected with a smartphone. First, configure CSW-H80 for the ad-hoc mode. Second, enter the App available for TCP socket communication with the smartphone. Finally, you can transmit and receive serial devices’ data with the phone. However it is unlikely to be used in case of an Android-based smart phone. Therefore, you should consider it before implementing.